Cost: £952 inc (High season April - October). £895 inc (Low season November - March). Premium Training - Guaranteed no more than 3 students on the course. This is the first of the advanced courses in which you will undertake longer coastal passages and navigating at night to become a Coastal Skipper. Skippering a yacht offshore requires you to have strong and confident leadership skills with complete faith in your seamanship and navigational skills, regardless of what “Mother Nature” decides to put your way. 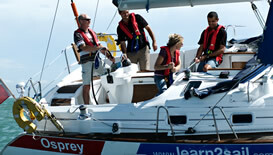 Those seeking a recognised RYA Coastal Skipper qualification in yachting. To be able to charter a boat. Those out to become more confident and to be able to go further afield. 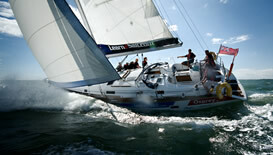 Confident in your decision making with respect to all aspects of handling and navigating the yacht. Skilled in longer offshore passage planning and its deployment. Conversant with the Rules of the Road and how they apply in every day situations. Confident in night sailing and watchkeeping. You will be a confident and knowledgeable Coastal Skipper in your boat handling and navigation.